Constraints on resources and a rising demand for services place current healthcare systems under increasing strain. Cloud services are increasingly helping to deliver new services, improve efficiency, reduce costs and improve patient experience From system performance and care management to individual insights and employee mobility, healthcare organisations everywhere are embracing cloud technology to cost effectively modernise the healthcare environment. How does Trustmarque help Healthcare organisations? As Trusts and Boards look to drive down costs, many senior leaders are turning to new technologies to find efficiencies, enhance user experience and improve productivity. We create innovative solutions for healthcare organisations by combining our service expertise with our technology partnerships. We provide end-to-end services for our healthcare customers, from software and hardware procurement to fully managed services, analytics and machine learning to user adoption programmes, business productivity technology and cloud services. Our expertise in healthcare IT stretches far beyond traditional licencing provision and management. As Microsoft’s number 1 partner in Healthcare, Trustmarque can help you understand how cloud technology can help you meet some of the challenges your healthcare organisation faces. 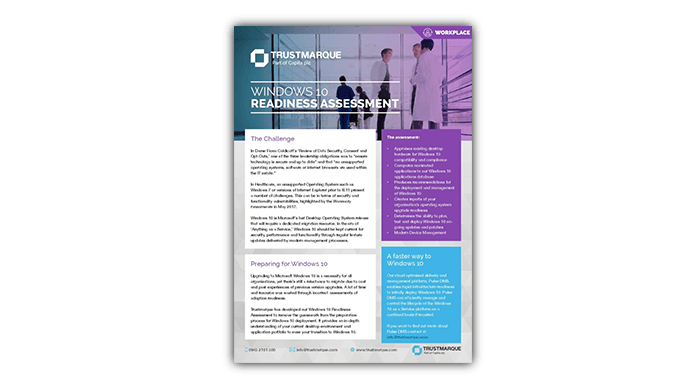 Trustmarque has developed our Windows 10 Readiness Assessment to remove the guesswork from the preparation process for Windows 10 deployment. It provides an in-depth understanding of your current desktop environment and application portfolio to ease your transition to Windows 10. A fundamental dynamic of improving patient outcomes is the ability to make better and smarter decisions. For example, seeing a patient quickly to reduce effects of injury, cutting emergency re-admissions, or being able to consult with the right group of people to reduce referrals. Using cloud technology is making these and many more applications possible as well as affordable. Having a truly mobile workforce can bring huge benefits to both patients and staff. Using technology such as Skype can save the patient a journey for a routine appointment or a consultation. Likewise, for staff and other healthcare visitors who are out on their rounds, if they can securely access and use databases from a mobile device this will stop duplication of work at a later time. It will also reduce travelling to and from the hospital and frees up resource, while increasing patient contact time or the ability to see more patients in a day. Our NHS specific Customer Immersion Experience (CIE) demonstrates Microsoft hardware and software so you can really get hands-on with integrated collaboration tools. In times of budget constraints, cloud based models can shift the financial focus from Capital Expenditure (CAPEX) to Operational Expenditure (OPEX), simplifying budgeting and reducing depreciation, as well as reducing spending on any large up front outlay for infrastructure. Subscription based cloud packages also allow spending to be controlled by only using what is needed when it’s needed. As a consequence, costly infrastructure and licensing packages can be reduced and ultimately removed. Cloud technology allows healthcare organisations to rethink their real-estate as well as looking at how their physical IT estate can be reduced by harnessing a UK Data Centre to store data. Neither maintaining nor sticking plaster fixes to existing IT systems are an option after the results of the Caldicott review and Care Quality Commission review. A wholesale replacing of some systems and radical updating of others is needed to ensure fit for purpose IT systems and ensure the security of patient data. However, replacing an entire IT infrastructure is costly in terms of finance and resources. Cloud alternatives such as secure email, data sovereignty and authorised user access raise concerns over Information Governance and conflicting information over compliance creates barriers to modernising and replacing older infrastructure. Use of cloud technology in the public sector will increase as security and regulation concerns have been addressed now Microsoft launched its UK data centres back in 2016. Using Azure and Office 365 can alleviate storage issues and offer on-premise / cloud hybrid solutions, as well as opening up opportunities for new and more efficient ways of working.